SKALARKI MCDU PROVersion comes already assembled and ready to work. But to get it working, power supply for LCD screen and IO is needed (not included in package). In older version of MCDU both of them are 5V DC, but in newer version it can be different (please check on label situated on back side of the unit) and their connectors are situated at the back of unit. For older versions of device, one power supply 5V DC and 3A (for new MCDU - 12V 1.5A) can be used for both connectors. As LCD power must be supplied, the backlighting is not necessarily. Backlighting circuit is separated and can be switched ON and OFF from pedestal switch panel if needed. Next step is to download latest release of SkalarkiIOProfiler. Package contains some folders including USB divers needed in next step. After downloading just run installer. All new versions and updates will be handled by auto updater feature build into Profiler. Once everything is ready (PSU for at least LCD is connected) plug in USB into PC. 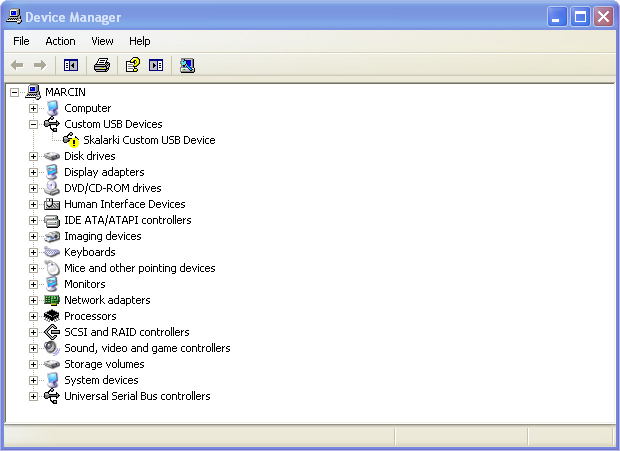 As this is USB device installation procedure, proceeding is exactly same like for any other USB hardware. Connect unit to USB socket. 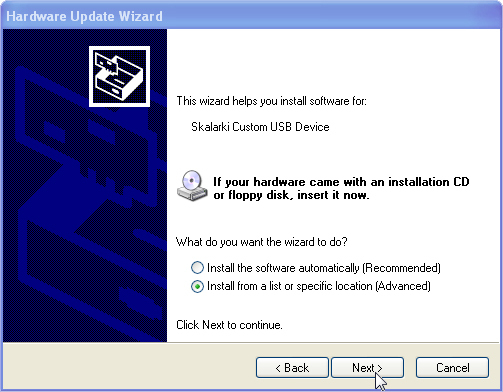 Once MCDU is connected to PC, windows will ask for driver for new USB device, then point search patch to folder with SkalarkiIOProfiler unpacked in point 1. 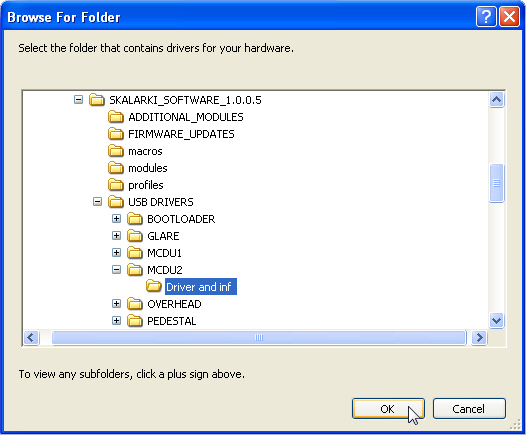 If you have bought only one MCDU use driver from folder MCDU1. If you have two you will need install different drivers for both MCDU's for CS side from MCDU1 folder. For FO side from MCDU2 folder. Label with MCDU type (MCDU1 or MCDU2) is situated on back cover of the unit. 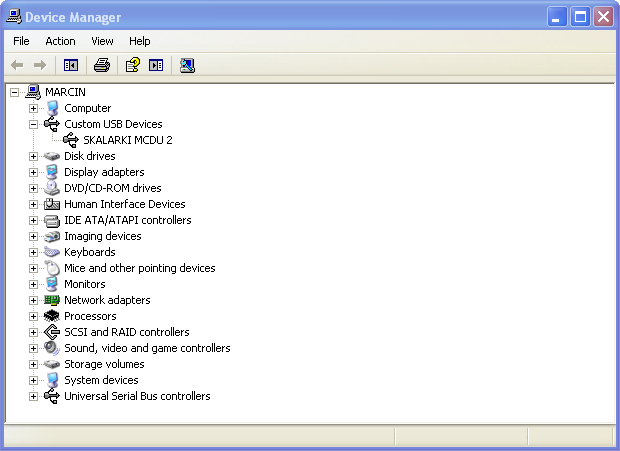 Once driver is installed correctly device will be listed on the Device Manager list. This message confirms that USB driver was installed correctly. If for some reason next to name of usb device, in this case SKALARKI MCDU2, red cross or yellow exclamation mark appeared - driver wasn't installed correctly. 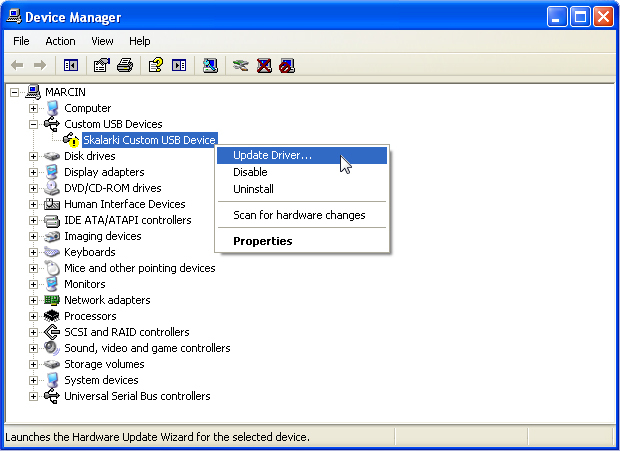 To reinstall driver right click on device name, then click on "Update Driver" and follow the screens below. And finally you will end up with USB driver installed. See screen below. This example was for MCDU2 (FO side - in situation user has got two MCDU devices) but in exactly same way MCDU1 driver has to be installed. 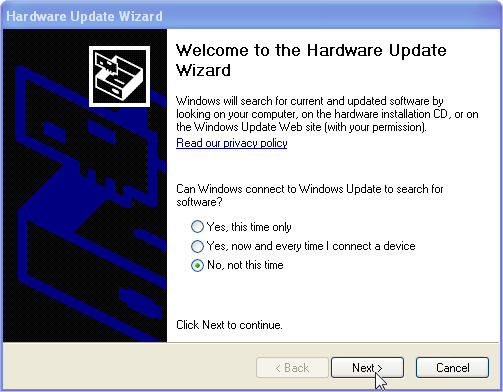 After successfully driver installation proceed to next step.